Gail Nichols is a potter whose technical research and artistic approach to soda firing has literally opened up new aesthetics in the world of ceramics. In contrast with the general rule of using high contents of silica in the clay, she uses high alumina clay bodies which reacts to soda vapour to create a generous opaque glaze, dimpled and frosty matt, giving the impression of glacially flowing ice. It bears little resemblance to traditional salt glaze, or to the bright glassier styles of soda glaze. 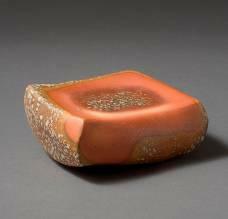 Unlike slips or detailed surface marking of much salt and soda glaze work, this very special technique tries to focus toward another aesthetic in which the thickly formed glaze flows over, interacts with and softens the form. Fairly slow cooling is required to create frosty mattness (two hours to 1100 °C and three more to 800 °C). It was also discovered that water vapour in the kiln can alter the glaze colour and increase the crystalline mattness. 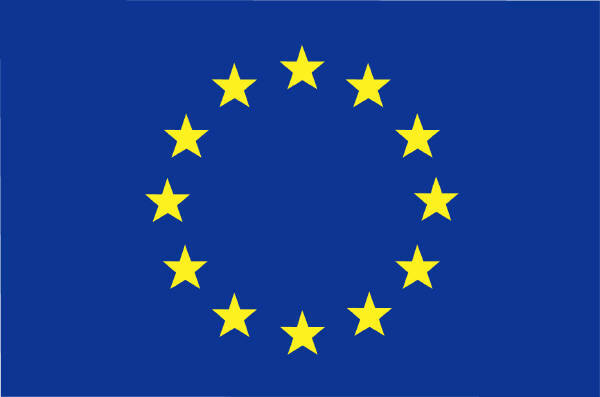 Compounds like calcia, magnesia, silica, iron or wood ash are to be avoided. After reaching 900°C start reducing and fire up with light to medium reduction. Soda introductions begins at cone 8 with intervals of about 15 minutes with temperature raising up to cone 9 and 10 down. At cone 10 maintain temperature for two hours (cone 11 down) then fire down to 1000 °C in two hours and again cool down normally to 800 °C in three hours. In Gail Nichols experiments, the soda “ice” glaze formed most successfully in oxidation. Its maturity and colour were enhanced by reducing during the first cooling stage. When reduced cooling below 1000 °C, the colours became muted, producing dull browns instead of reds and oranges. Reduction during the high temperature glaze forming stages produced some strong colours with close resemblance to traditional salt glaze. 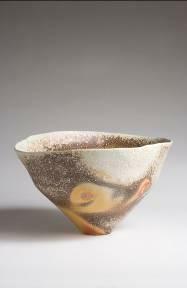 Shino style slips and glazes also developed much stronger colour when exposed to this reduction. It seems that for colour enhancement during cooling, water vapour is most effective between 1000 °C and 800 °C. Water during cooling can also be used to create matt glazes from otherwise glassy surfaces. Copper and manganese pigments blend well with soda “ice” glaze. Strong red colours are assisted by a reducing atmosphere and water introduction during glaze forming stages, as well as by reduction during the early stage of cooling. 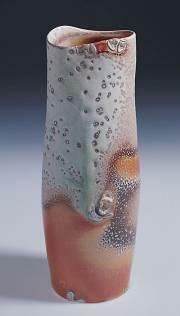 The “ice” glaze owes its opacity and mattness to a complex mixture of surface distortion and crystallisation. Its icy character is caused by its high soda content, the complete absence of other fluxes, its low silica/alumina ratio, and the absence of crystallised iron. The best ice glaze seems to be obtained in oxidation. Gail Nichols has written a book, “Soda, Clay and Fire” on her distinctive approach to soda vapour glazing published by The American Ceramic Society in 2006.